BOWLING GREEN. Ky. - May 6, 2010 – Despite severe rain and flooding in Bowling Green, the 8th annual Holley NHRA National Hot Rod Reunion will still take place at Beech Bend Raceway Park on Father’s Day weekend event organizers announced today. “Beech Bend Park and Bowling Green will once again benefit from the return of the annual Reunion on Father’s Day weekend and help the community make a speedy recovery with the millions of dollars generated by the Reunion,” said Tony Thacker, event organizer. Heavy rains have soaked Bowling Green and the surrounding areas for days. The rapidly rising waters led to the Beech Bend Raceway drag strip and other areas being completely submerged. Beech Bend Raceway Park Officials announced Monday that flood waters are receding and the drag strip will be ready for the June Reunion weekend. 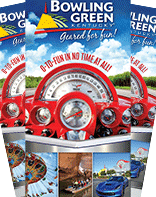 “Despite severe weather, the Bowling Green community will pull together to see that our venues are ready for the numerous summer events including the popular Holley NHRA National Hot Rod Reunion” said Vicki Fitch, executive director of the Bowling Green Area Convention & Visitors Bureau. The Reunion is a windfall that will pump an estimated $4 million into the Bowling Green economy during the 3-day Reunion at Beech Bend Park. In addition, event ticket sales are strong and continue to rise every week. Huge numbers of Reunion fans are expected to come to the event this year filling up hotels and restaurants, renting cars, buying gas, and dropping cash on souvenirs and entertainment. Annually, the Reunion brings in a crowd of over 50,000 from across the county as well as international guests. This year marks the seventh year the National Hot Rod Reunion has taken place in Bowling Green, KY. Since arriving at Bowling Green in 2003, the Reunion has poured more than $10 million into the community, based on analysis done with the help of the Kentucky Department of Tourism and the Bowling Green Area Convention and Visitors Bureau. The Reunion is a commitment by the non-profit Wally Parks NHRA Motorsports Museum (the Reunion producers) to continue to become part of the community and help bring tourism dollars to the area. Many locals are hired to help operate the event, an added benefit to the economy by creating job opportunities and more tax revenue. The 8th annual Holley NHRA National Hot Rod Reunion, June 18-20 at Beech Bend Park in Bowling Green, Ky., is a three-day festival of speed, hot rods and American automotive enthusiasm. Produced by the Wally Parks NHRA Motorsports Museum, presented by the Automobile Club of Southern California and located in Pomona, Calif., the Reunion is part of the museum’s “living history” philosophy, which works to bring to life the sights, sounds and people who made history in the early days of drag racing, land speed racing and the golden age of American car culture. Unique among motorsports events, the Reunion honors some of the top names in hot rodding from the past and features a fabulous array of cool drag cars, street rods and customs of the historic and present-day hot rod eras. Three-day spectator credentials are available for $55. Three-day spectator credentials include a pit pass, souvenir reunion program, dash plaque, and a commemorative laminated credential. Full event credentials will be available online at http://store.nhra.com through May 29, 2010. Single-day tickets will be sold at the gate each day of event. Prices are inclusive of all fees, so no additional charges will be added to the published ticket price at online checkout. Children 16 and under are admitted free with paid adult admission. Tickets are also available by phone at 800/884-NHRA. The Reunion features a wide variety of activities and events, including: Hot Heads vintage drag racing, featuring some the sport’s most famous and historic cars and drivers, racing in such classes at Nostalgia Top Fuel, Altereds, Supercharged Gassers, Classic Super Stock, Hot Rods and others. SoffSeal Show ’n Shine with thousands of gleaming pre-1980 hot rods, custom cars, classics and muscle cars. “Memory Lane” will have a display of nostalgic race cars. The Heacock Classic Reunion Thursday night Cruise at the Grounds at Hartland Park, next to the Holiday Inn, will bring back the good ol’ days of hot rodding back to Bowling Green. Cruise ends at the National Corvette Museum. While on the cruise, hot rodder’s can get a great photo of their ride at the newly renovated Standard Oil Company gas station. National Hot Rod Reunion Honoree Reception, held at the Holiday Inn University Plaza’s Bowling Green Convention Center ballroom on Friday evening, June 18. Open to everyone at no charge, it’s a tribute to the Reunion’s Grand Marshal and Honorees and a chance for fans to meet some of drag racing’s heroes. Meet the Reunion’s Grand Marshal, Honorees and other drag strip legends at the Dynamic Legends VIP Tent, sponsored by Dynamat, all weekend long at the track. 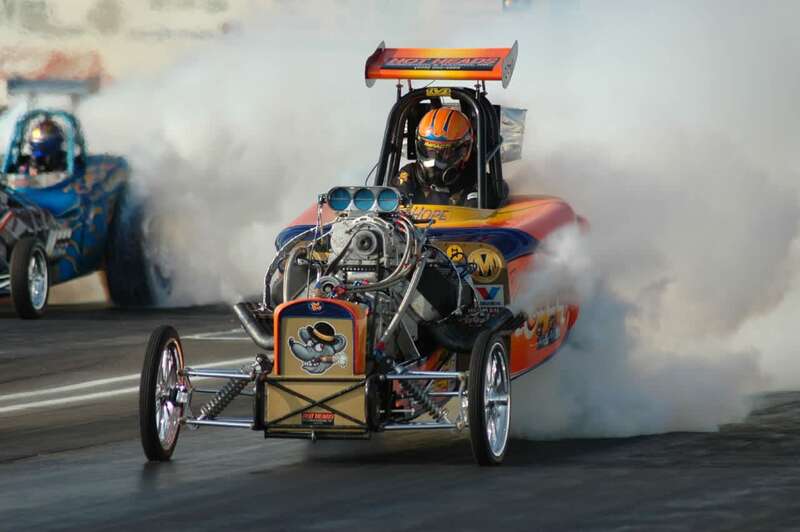 Cacklefest on Saturday evening, where nitro-burning historic, front-engine top-fuel dragsters and other classic race cars are push started just like in the “old days.” The Reunion Midway is filled with manufacturer and commercial exhibits. A huge Swap Meet of used parts and other treasures. A separate amusement park with rides and games for all ages adjacent to the park.